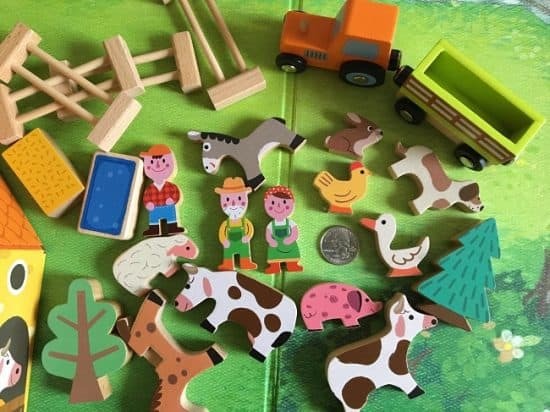 Wooden toys promote imagination, last longer, and can be made without harmful chemicals. Here are a few of our favorites for your toddler or baby. Do you remember the days of going to Grandma’s house and finding those good wooden toys that everyone wanted to play with? No, I’m not talking about some of the cheap stuff you’ve seen around, I mean solid wooden toys. These are the types of toys you imagine opening as a toddler on Christmas morning. Once you introduce the noisy, button pushing, or electric toys, it’s hard to go back. As a parent, that’s personally something I want to stay away from as long as possible. Here are a few other good reasons why you should go with wooden toys. So, Why Buy Wooden Toys for Kids? With all of the electronics and fancy toys out there, why go with a wooden toy for your toddler or baby? First of all, if you get an organic or solid wood toy, it doesn’t have the harmful chemicals that can be found in plastic. As young children like to put toys in their mouths, this is really important. That doesn’t mean that any wood toy is safe from chemicals. Clearly, toys made with treated woods might fall into this category. However, you can purchase wood toys that come untreated without oil, wax, or ink. The type of wood you purchase is more important for your baby or 1-year old as they still put things in their mouth. Wooden toys also tend to be of better quality and more resilient and therefore make a good gift idea that will last a long time. My wife and I have had countless plastic toys get chewed over, broken, and eventually thrown away. A good quality wooden toy may last through not only all of your children but passed on as well. Lastly, wooden toys allow your children to develop their young imaginations. This is one of the most important stages of their entire life for brain growth, creativity, and development. Plus, getting your toddler away from the annoying plastic toys with buttons and sounds is something you’ll thank me for when she’s quietly playing! Looking for a good wooden toy for your toddler, baby, or 1-year old? Below, I’ll go over some toys that are not only fun to play with, but safe too. Have a wooden toy that you love? Be sure to let us know in the comment section below. Ready to start your wooden toy collection? 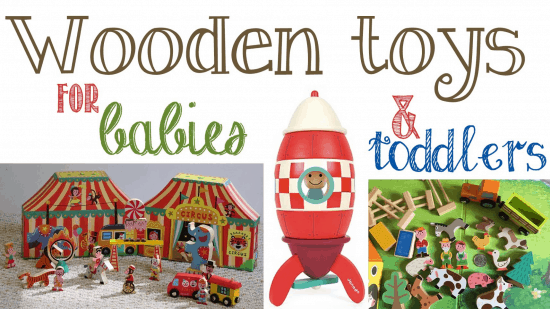 Here are some good wooden toys for your baby. 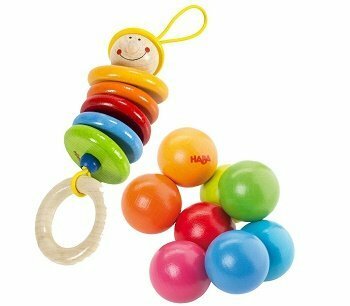 German manufacturer HABA makes this fantastic clutching toy and rattling Max Dangling figure as a set. Either toy can be placed in the mouth as the paint for it is extremely durable. The beach wood from the toy is taken from sustainable forestry in Germany. The toy is non-toxic, lead free, and uses a safe water-base stain. The clutching toy features 8 ping pong-sized balls that can be moved around and played with by your baby or even 1 year-old. In terms of size, it lines up to be around 4″ x 3″. This cute rattle can be purchased as a set along with the Magica Clutching Toy. It bends in the middle and uses similar safe materials as the Clutching Toy. You can attach it to your stroller or car seat with the ring. 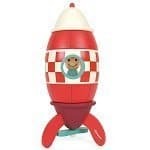 Overall, it’s a fantastic wooden toy and one of several that I’d recommend from German manufacturer HABA. 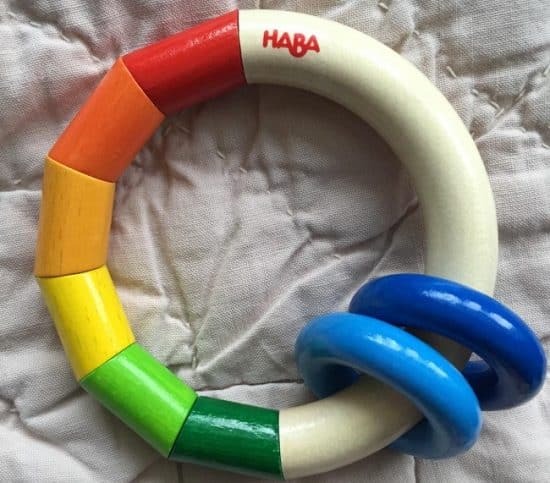 Here’s another great toy from HABA for your baby. It’s a wooden baby rattle that doubles as a teether and a clutching toy. Like the products above, it’s made with renewable beachwood and is made with safe water-based paints. So, your child’s teeth are finally starting to come in. It’s so fun to watch! 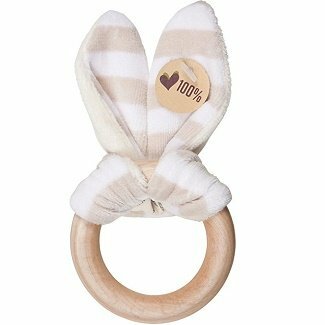 Rather than reaching for a plastic teether why not go with an organic wooden one? This one, from the Olives and pickles brand, is made of maple wood and not treated with oil, wax or ink. In addition, the fabric on this toy is 100% GOTS certified organic cotton. So, it’s perfectly safe for your little one. Janod is a French company that designs some fantastic traditional toys. 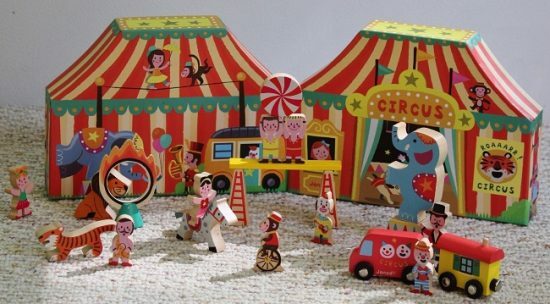 This one is a circus that has 19 wooden pieces that all fit into the hardy circus tent cardboard box. These pieces are made from real wood and work well together. The little people can be moved around so your toddler can perform their very own circus. Janod also makes a 23 piece story box farm that’s really cute. It’s set up similar to this one with the varying pieces allowing for your child to pretend that they’re on the farm. 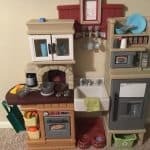 Overall, these are two good wooden toy sets I’d definitely recommend for your toddler. That being said, some of the pieces are small, so don’t let your younger children who put things in their mouths play with them. 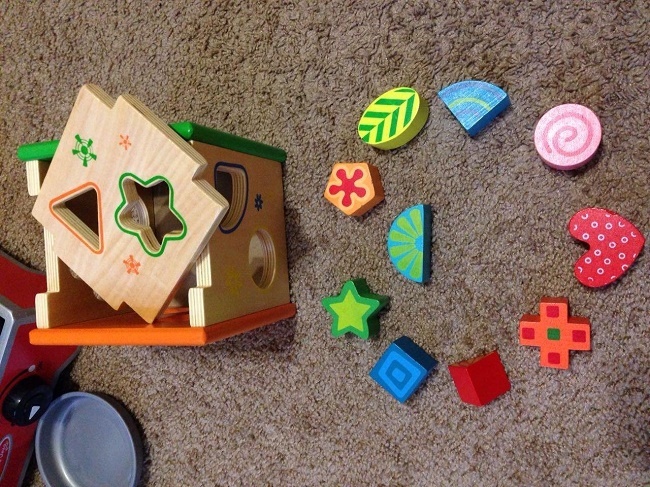 This wooden toy is your basic shape sorter but has a bit more going for it. First of all it’s CPSC certified and thus use non-toxic water-based paint. 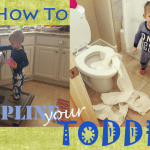 This is great for your young toddler or 1-year-old. Second, the shapes are more fun than traditional options and the color is fantastic. 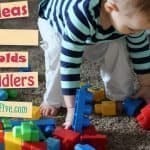 For those who aren’t familiar with the benefit of these types of toys, they help your child to develop not only their hand eye coordination but their motor skills as well. A toy like this is also great for bonding with your baby and teaching her while you play. There are a lot of these wooden shape sorter toys on the market but this one is my favorite. Many of the less expensive ones are cheap, have uneven shapes, or even cracked wood pieces. So, I recommend you pay about $5 more and go with this. Here’s another great wooden toy piece from French designer Janod. The pieces are solid wood and teach your child to learn the alphabet as well as object orientation and recognition. Each piece is painted with one of 13 bright colors. Clearly, Janod isn’t reinventing the wheel here. However, the piece is of good quality and clever in its instruction. This is an amazingly decorated rocket with great color. It’s awesome for that kid dreaming of their future space adventures! No, this piece isn’t entirely wooden. 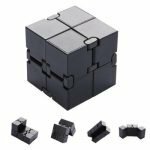 It has some magnets that hold it’s five wooden pieces together. There’s also a little guy that can be put right in the middle. It’s a puzzle with just the right amount of difficulty for this age. 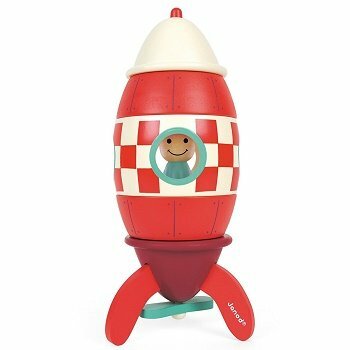 The Super Rocket 3D playset is recommended for young kids and toddlers around 2 years old. I don’t recommend all of Melissa & Doug’s wooden toys. Some of them aren’t made up to the standard that I look for. However, their wooden block set is good and affordable. 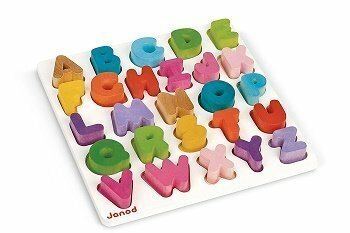 It comes with 50 traditional wooden alphabet blocks with varying colors and shapes. 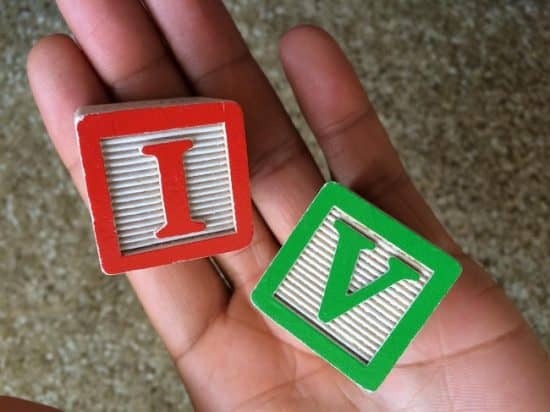 This toy is great for a toddler or two-year-old and not only helps them to learn their ABCs but also allows them to match stack and sort however they want. For storage, this set includes a pouch as well. For all this it is a great value.